Argh! I’m rather sick at the moment, and what started as a case of the sniffles has become an extremely sore throat and cough complete with failing voice. I’ve been taking medicine, sucking back cough drops, and sitting around the house all day. Did a little schoolwork too, seeing as how school starts again Monday. Speaking of which, I must voice my displeasure with the fact that despite Monday being a bank holiday for the observance of New Year’s, we still have to go to school. Boooooooo. On the bright side, look! 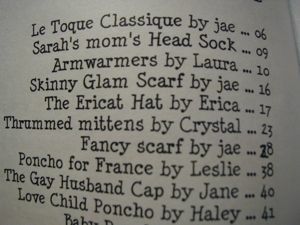 I’m published! 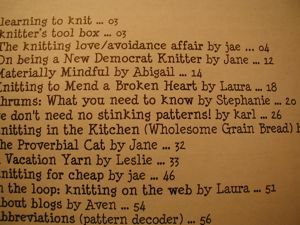 It’s “Take Back the Knit”, a faboo zine by my pal jae, and I’ve got two articles and one pattern! Yay! I’m brimming with ideas for the next issue (submissions due March 28, 2005) and I even remembered to write said ideas down so I can actually write the articles. My Koigu glove was getting boring (and feeling unnecessary, as it’s positively balmy at above freezing here) so today I worked on my Must Have. For some reason, my camera decided that the sweater is red, rather than the dark brown it really is. 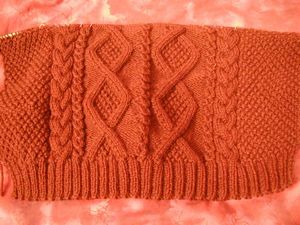 No one would notice this (except maybe people who’ve made this sweater) if I didn’t mention it, but I changed the diamond cable crosses in the back to cross symmetrically away from the center of the back. I’ll do the same on the front pieces. 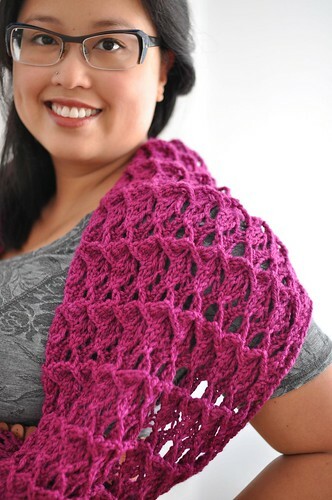 I’ve got 10″ done, so I think I’ll do one more diamond before starting the armholes. 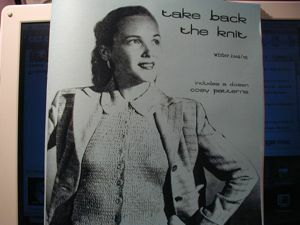 Maybe a little more, because I want the sweater to be a little longer than the pattern calls for.